The Tabakalera building was a tobacco factory in San Sebastián for 90 years (1913-2003). It was a state factory, built on a municipal land, after 25 years of complicated works. The tobacco factory was built in the style of the old manufactures and around four large courtyards. It is one of the largest lots in the urban area of ​​San Sebastián. The main building is a rectangle of 113 × 75 meters. Tabakalera had its golden age in the 20s, when the production of cigars and cigarettes started to be mechanized. In 1925, more than a thousand people was working there, almost all women. In the second half of the 60s, the factory lived another technological renovation and reached 250 million packs a year. At that time they stopped producing Farias cigars in order to specialize in cigarettes: Celtas, first, and Ducados and Davidoff from the 70s. Following the privatization of tobacco production in Spain, the new company – Altadis – closed eight of its factories, including the one in San Sebastián in 2003. Faced with this situation, the San Sebastián City Council, Diputación de Gipuzkoa and the Basque Government bought the building to turn it into an international center of culture. In order to convert the old tobacco factory into a center for contemporary culture, the building has been opened to the city, eliminating gates, surrounding walls … creating an internal street of free circulation. 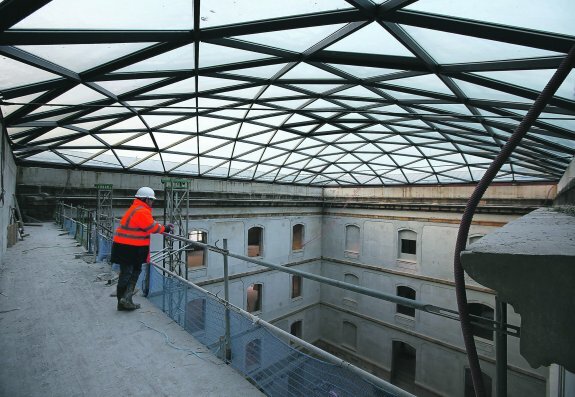 The building has an area of ​​37,000 square meters divided into five floors and a new main entrance. A glass prism has been built to give greater visibility to the building and provide a new point of view of the city. The spaces of the center are hybrids and adaptable to a great diversity of uses. 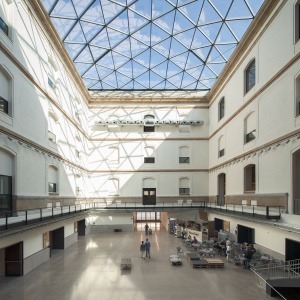 Mercortecresa has taken part in the restoration of the building of Tabakalera with the installation of triangle model smoke ventilators.